1017A Waverly is a unique Craftsman inspired home,priced at $443,500. 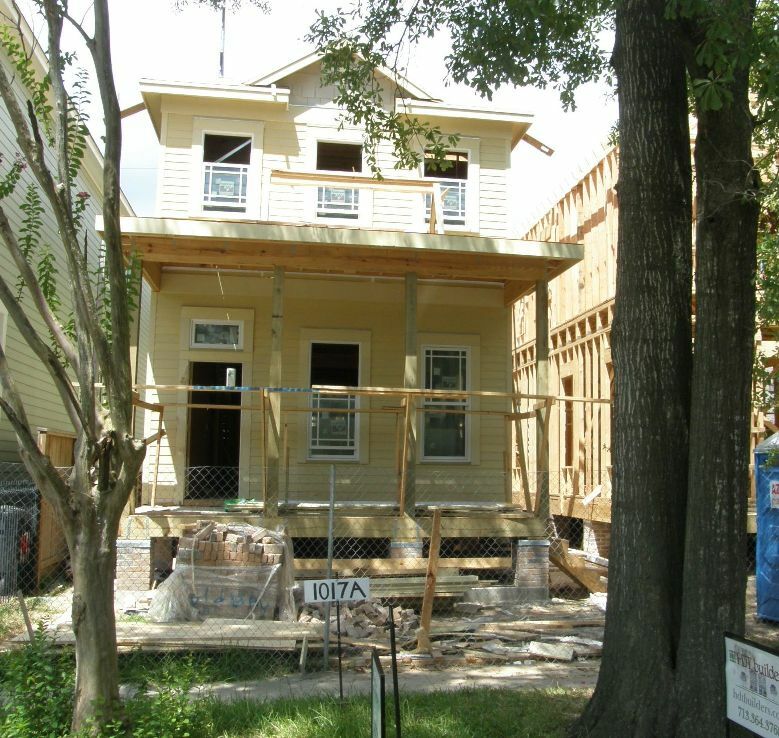 March 2017 Update: HDT Builders continues to build in the Heights and has 4 homes for sale at 212-224 W 24th St.
Two New Homes Being Built by Houston Heights Builder, HDT. It is 2168 SF plus unfinished room over garage. 3 bedrooms, 2.5 bath, 2 car alley access garage. The front porch will have square, tapered columns. It will also feature angled, shingled skirting around the front. The entry door will have a stained glass transom window over it. It will be the refinished original door from the house that once stood on this property. • Unfinished room over garage – endless possible uses for this. 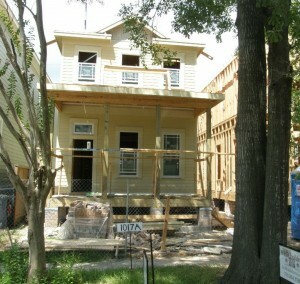 As of 08/20, this house has most of the siding installed. The roof will go on next week, followed by the HVAC system; then plumbing. Dee says the plumbing and A/C can’t be done concurrently because “Boys don’t play well together” in the confined space of the attic. So, one will do his work, then the other will follow. I have to say that working with Dee (Dee Todd Simmons of HDT Builders) is a delight. You’ll find her on site every day, overseeing the subcontractors. The second house (1017B Waverly) is not as far along as this one. As a crew finishes their job on “A”, it moves over to “B”. So, it will always be a little behind. Details on it will follow, but it will be a different Home altogether. The brick columns and brick trim were just done on it…a very nice front elevation. If you have an interest in one of these homes by HDT Builders, feel free to contact me for more details, or to visit.